the title for the first time since picking up the volume, it seemed perfect – Guns of Vengeance. 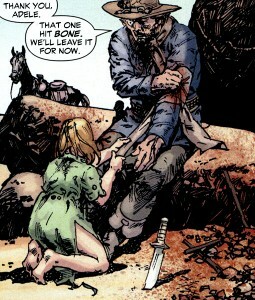 A fitting title for this collection, the second contemporary Jonah Hex trade paperback. Continuing the ongoing written by Jimmy Palmiotti and Justin Gray, the book features work by an impressive stable of artists: (in order of appearance) Luke Ross, Dylan Teague, Val Semeiks, Dan Green (on Val’s inks), Hex Co-creator Tony DeZuniga, Phil Noto (with his own colors), David Michael Beck, and Paul Gulacy. Except for Phil’s story, the colors are handled by Rob Schwager. All the artists have a little bit different take on our mutilated mudruckin’ Hex, but no one is phoning it in here – it’s a sterling set of work. Pretty ladies and beautiful sunsets, wide eye’d innocents and Hex’s ugly cuss, plus of course a wide variety of graphic and artfully implied violence – it’s all here and rendered wonderfully, if not quite tastefully. That might depend on your personal disposition. Back to the theme of vengeance. 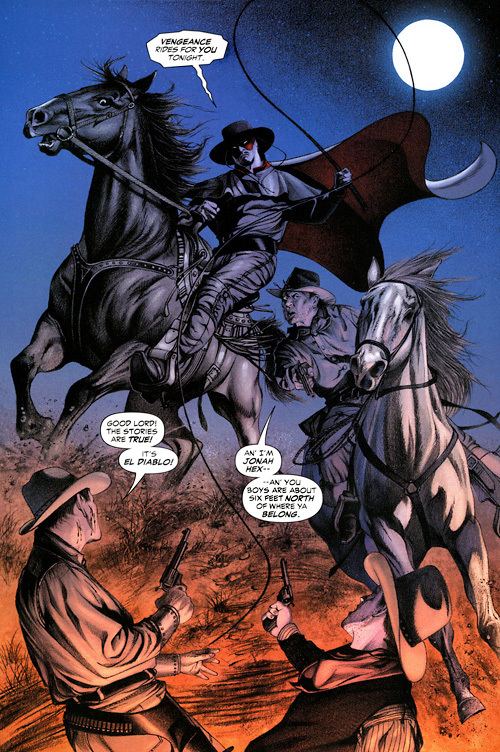 This is a motif close to the heart of the western and just as classic for comics. Brian made a comparison between Hex and Batman in his review of the first book, and it’s fair: Batman also burns with revenge. A cold, dark man. His actions are understandable, in their way, in this world. These tales of manly revenge take place across an assortment of classic stages, from boom towns gone bad to dusty deserts, snow-capped mountains and even the dank and verdant recesses of a nasty hick (and gator) filled swamp. This last one plays to the strengths of Noto’s coloring. 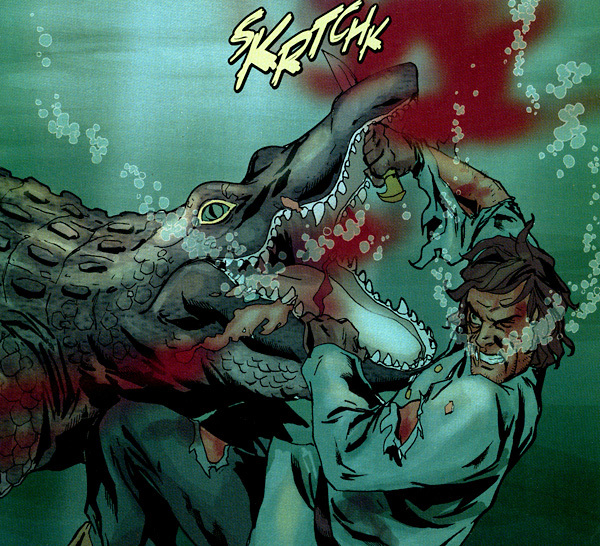 The storytelling is very good, with a time hopping pacing punctuated with the odd movie style title panel – “Hellfire Rains on Texas” or “The Jaws of Death” – lending a lighter pulpy mood to the grim events. Similar to the first book, the stories seem to be self contained, but there’s actually a fair amount of continuity here. One particular story (actually my favorite of the bunch) features El Diablo, who discusses Hex’s meeting with Bat Lash in the past volume. This story is a continuation of plot threads left off in that same book. 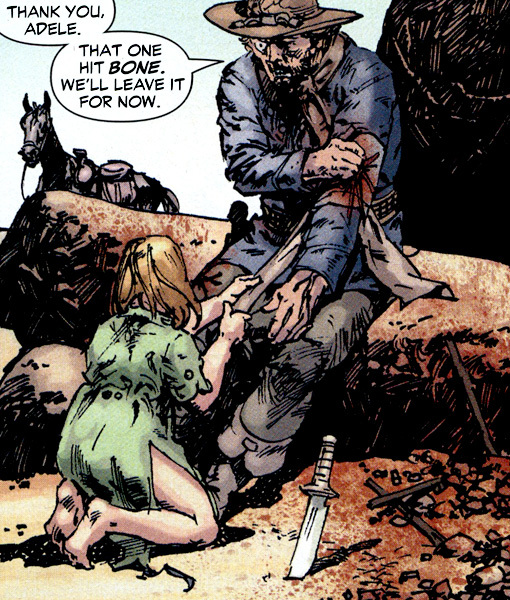 I quite enjoy the treatment of the other western characters in this series, where it seems as if they are old acquaintances with long histories – a nice nod to the publications they shared for many years even if their stories rarely crossed over in the Bronze Age. Other feelings of continuity are more subtle. A building of the character, some stories that feel like they play off classic tales (including one, Gettin’ Unhaunted that I think is a riff on a Bat Lash issue, though perhaps primarily in theme rather than direct connection.) While the stories here are good, I find myself hoping for more longer arcs and reoccurring characters. It’s worth mentioning again how great it is to have original Hex artist Tony DeZuniga contributing to this book among all these young guns. He really lets loose here. though one of the more tasteful when it comes to actual violence, his Hex is quite possibly the most grotesque of the bunch, yet also the most relatable. 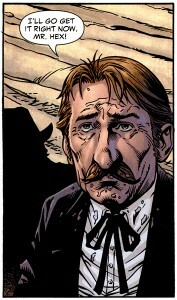 There’s a sadness, a softness in those eyes, which coupled with the strange events of this story makes for a moving and, because this is a Jonah Hex book, slightly disturbing tale. A problem with vengeance is that it may be short term satisfaction – the death of your enemy, the death of a killer may seem just, but it probably won’t fill the voids left by their actions. Hex isn’t sure whether he does God’s work or the Devil’s – or perhaps some wrathful combination. It’s such that tortures Jonah Hex, but lack of fulfillment for the hunter still makes for a cruelly satisfying collection of stories. 4 of 5. Good wholesome violent fun, with a hint of morality play and top notch art. The stories can be a tad predictible, and might benefit from some more characters that aren’t dead or left behind by the end. 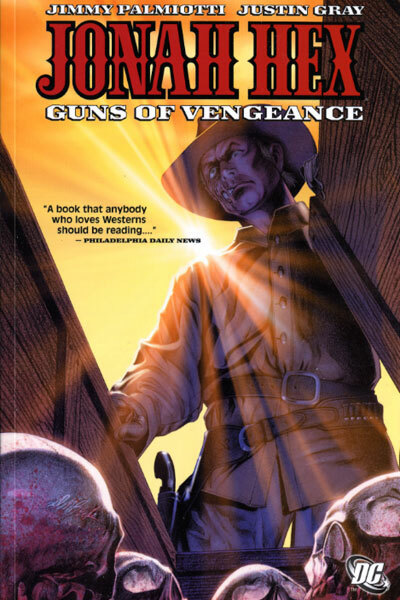 Overall, highly recommended to any fan of westerns, bloody vengeance, and fitting ends for bad men. Reading this book is reccomended before moving on towards the next Jonah Hex book. 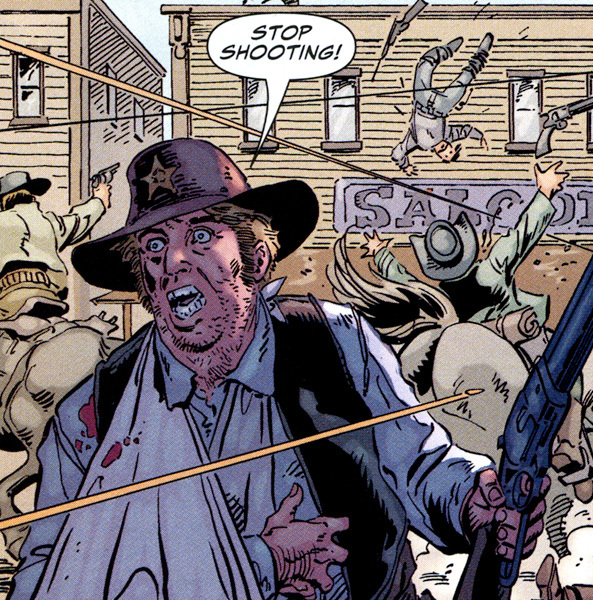 Read Showcase Presents Jonah Hex and/or Jonah Hex: Welcome to Paradise. 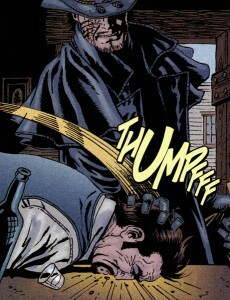 Follow that up with Jonah Hex: Face Full of Violence. Showcase Presents: Bat Lash is recommended for enjoyment of the previous volume. 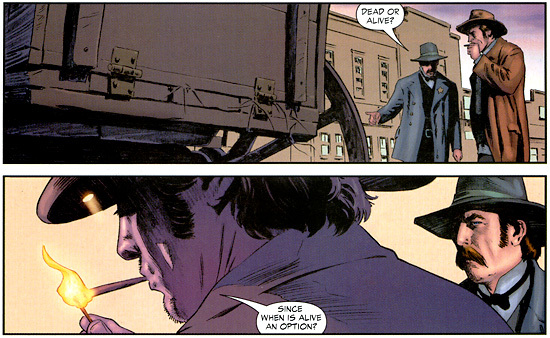 Jonah Hex: Two-Gun Mojo is skipable, in this reviewer’s opinion. The 2001 El Diablo Vertigo series is great, but doesn’t tie in directly – feel free to read it at any time. 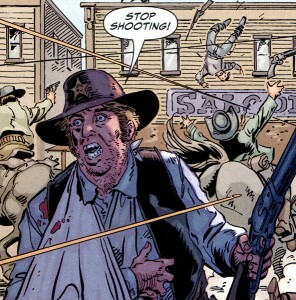 The immediate next stop (on the DC Universe reading order, for the DC Westerns, and Jonah Hex) is Jonah Hex: Origins, collecting issues 13-18 of this series. It’s the next stop for me as well, as I continue reviewing my way through the collected DC Universe – so stick around to check out that review in the next couple days. Someone may be very good at search engine optimization but stink at marketing and advertising. No one likes it when someone is copying off of everyone else.